The Fighting Stick Multi is a third-party arcade stick manufactured by Hori. It is compatible with multiple consoles, namely the Sega Mega Drive, Super Famicom and PC Engine, hence the "multi" name. The Fighting Stick Multi is a six button stick with some turbo options. Each console needs its own set of leads in order to use the device. 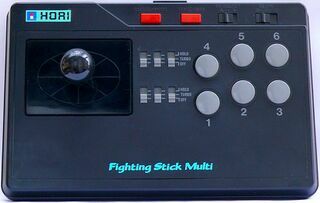 The Fighting Stick Multi was only released in Japan, although the similar Fighting Stick Dual was later released in North America, which only supported the Genesis and Super NES (since the TurboGrafx-16 was not as successful outside Japan), but was a more economical alternative. Main article: Fighting Stick Multi/Magazine articles.